Two Christie MicroTiles towers are providing a moment of serenity in the heart of frenetic downtown Toronto. 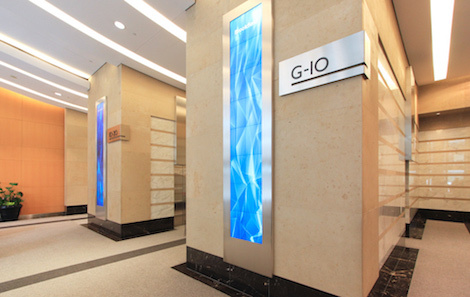 Located in the lobby of 2 Queen Street East, a 20-story Brookfield Properties office tower catering to high-end clients in Canada’s financial district, the 12-foot tall displays – bracketing the entrance to the elevators – whisper tranquility and calm to both tenants and guests 24/7 with ever-changing content, thanks to Forge Media + Design. 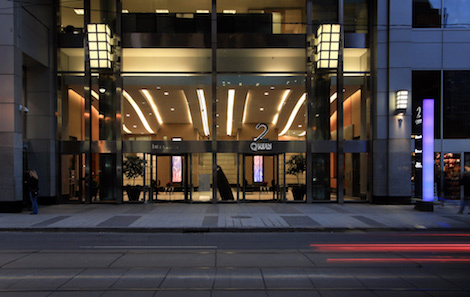 The Toronto-based company – with clients including Phoenix Sky Harbor International Airport, Four Seasons, Fosters + Partners, and numerous other high-profile institutions across North America – had completed the branding and signage for 2 Queen, which sits at the corner of Yonge Street – a busy subway stop – and were then asked to bring their ingenuity to the building’s entry experience for a refresh. “We wanted the display to look different every time someone saw it, so they didn’t feel like they were seeing a repetitive loop. Especially because this is a busy hub with not only the people coming into the building lobby, but people on the transit lines who see it along with all the pedestrian traffic,” added Roberts. We haven’t heard a lot about Christie MicroTiles recently, but they still are the ultimate digital canvas – providing amazing image quality, vibrant, true-to-life colors, brilliant displays and the flexibility to design in almost any shape or size. This entry was posted on Friday, April 7th, 2017 at 15:07 @671 and is filed under Scuttlebut. You can follow any responses to this entry through the RSS 2.0 feed. You can leave a response, or trackback from your own site.